We Did All We Could, and It Still Happened. We knew the forecast before leaving. We thought we’d covered all of the bases. Nope! We came home from Illinois, and we did not have water; it was frozen somewhere. Here in Arkansas, it got colder Saturday night than it did where we were in Kentucky and Illinois; it didn’t get above freezing at the RV park on Sunday. Temps Sunday night were going to be around 12 degrees, and the wind had been and continued to be brutal. Neither Jim nor I were worried because we had done what we needed to do to ensure all would be well. 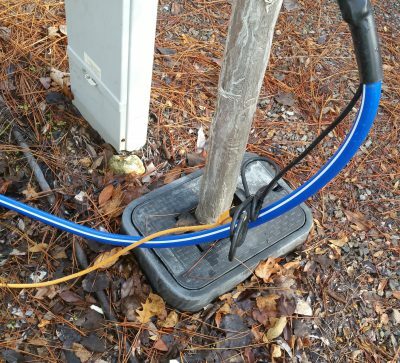 The water faucet at our site was wrapped and heated. Our water hose was heated. Our water filter and elbow were insulated. The heat was left on at a temperature somewhere between 55 and 60 degrees, circulating heat in the enclosed underbelly as well as inside. 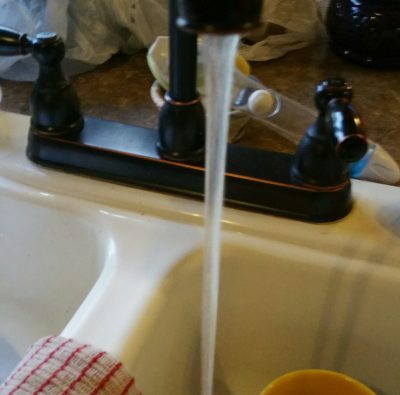 We actually turned OFF the water at the spigot. 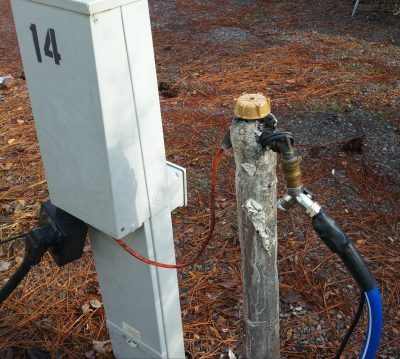 Site water faucet is wrapped and heated. 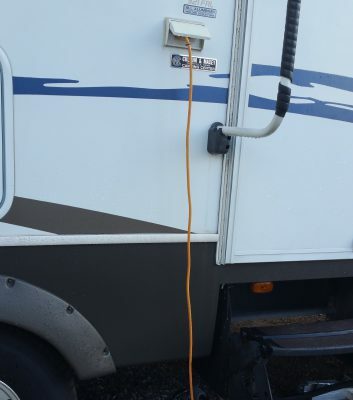 Extension cord is plugged into RV, thus, heating water hose. Monday, the high temperature was to be 33 degrees. Even though the water hook-up side of the RV really doesn’t get sun, we had a chance. By the time Jim got home, which was after dark, and no water was flowing, we decided the weak link had to be the only thing not heated: the water filter and elbow. He braved the dark and cold and removed the water filter. 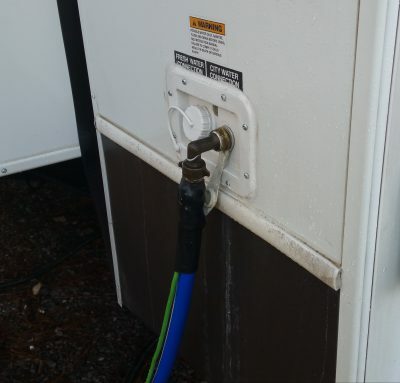 It was frozen solid, and there was ice in the elbow going from the filter into the camper. He brought that in, and we quickly melted the ice. Once all except the filter were put back in place, water flowed inside once more. 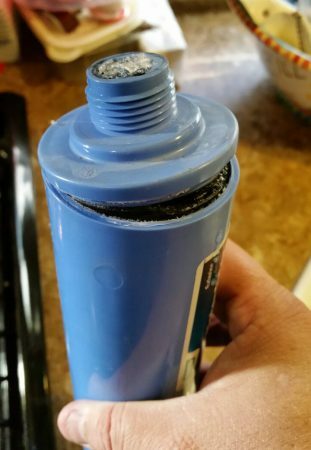 The only thing I can figure is that we failed to “drain” any remaining water out of the filter and lines after shutting off the water and before leaving on our trip. Monday night was another low-teen temperature night that was to get to about 12 degrees, but all was heated, so we felt confident water would be flowing in the morning. It was flowing when I got up to go to the bathroom about 1:30 a.m., but by 6:00 a.m. when we were up and going, nada! Jim immediately suspected the hose elbow, so he took it off. Nope, it was not frozen, and water was coming out of the hose. Evidently, something had frozen elsewhere, but we have a heated underbelly. It was confusing. Temps were to get into the 40s on Tuesday, so we made do and waited. About 2:00 p.m.in the afternoon, the water began to flow again. We still do not know what caused this second freeze since it is not like when Jim had heat issues last winter. Water flows again on Tuesday. For now, all is well, but as soon as Jim finishes this contract, I’m hoping we can point this camper south and go to much warmer weather where we don’t have to worry water freezing or about temps in the low teens even before chill factor is calculated. Sometimes, you think you’ve done everything you need to do to avoid a problem, and the problem happens any way. You just have to learn to roll with it, especially when one chooses to live full time in an RV. Stay warm! December 24, 2016 in Living in an RV Gets Real. Wow, I hope this doesn’t continue to happen. Merry Christmas to you both. Thank you, we know there’s always a chance for things to hit you, but the enjoyment we got from seeing the kids and grands and checking on the ones who just left the hospital, this was minor. It happens, we roll with it.